I spent £140 on my overdraft last week. BUT, that was putting a deposit down on accommodation for a festival my brother’s band is playing in this December, and I’ve only got one member left to pay me back, so I didn’t actually really pay anything. So it doesn’t count. So ner. I also purchased one ‘necessary’, which was a replacement hand cream for £2.50. Since I’ve been swimming again, I’ve gone through the other two hand creams I had like no one’s business! I think it’s going pretty well, to be honest. Much, much better than I thought I would. I’m staying at home more, which is probably helping a lot, but I’m really starting to think about what I’m spending, what I’ve got, and what I can afford. Hopefully this means that come June I won’t go as crazy as I might have gone before really thinking about stuff. Anyway, here are the details of my ‘shopping the stash’ picks for this week. I’ll show you the overview again. I must quickly say- that little basket is the best 75p I’ve ever spent! Two smaller palettes for my eyes this week, and this is the first appearance of one of my many Sleek i-Divine palettes. This week, I chose my poor, battered Au Naturel palette, and also my Soap & Glory Lidstuff in Smokey Dokey. 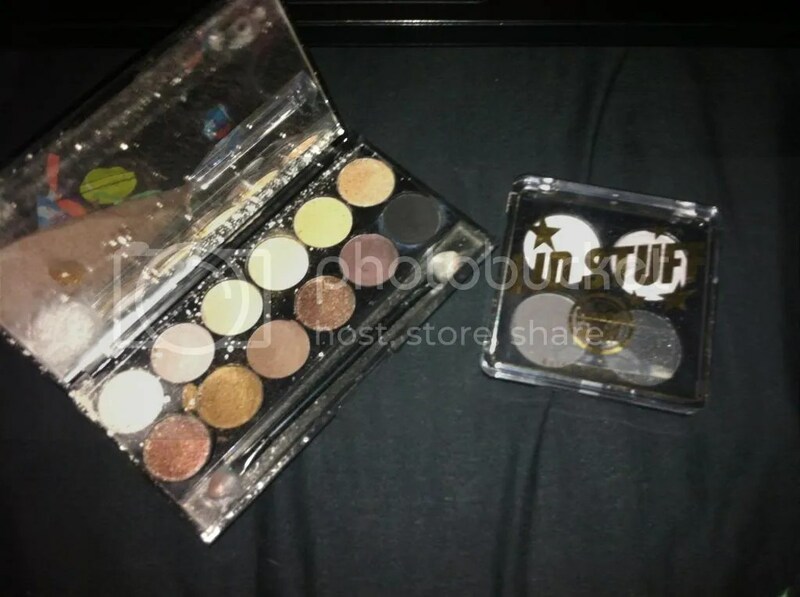 I love both of these palettes, they’re both brilliant for day or night, I’ve got a gig on Thursday (my brother’s band’s first proper, paying, headline gig! So excited!) so I’ll probably mix and match the palettes. Will definitely do an extra Daily Look and Make Up look post that day, if I remember to post my other outfit/make up look! I don’t know why I didn’t post my mascara/eyeliners after the shadows, last week! Think I lacked a little logic, there. Anyway, this week I’m using my beloved Bourjois Volumizer mascara- bordering on Holy Grail territory, I think!- as well as two cheapies for liner- the MUA glitter liquid liner in Night Sky, and a Primark black ‘eye liner’ pencil. This little pencil is brilliant, maybe even surprisingly so. It will be a good eye week, this week, I think! My second Benefit powder in two weeks! This week I’m using Dandelion, which is (as they describe it) a ‘brightening face powder’. I use it as something between a highlight and a blush, to be honest, and it gives a really nice, subtle, sheer baby pink colour. 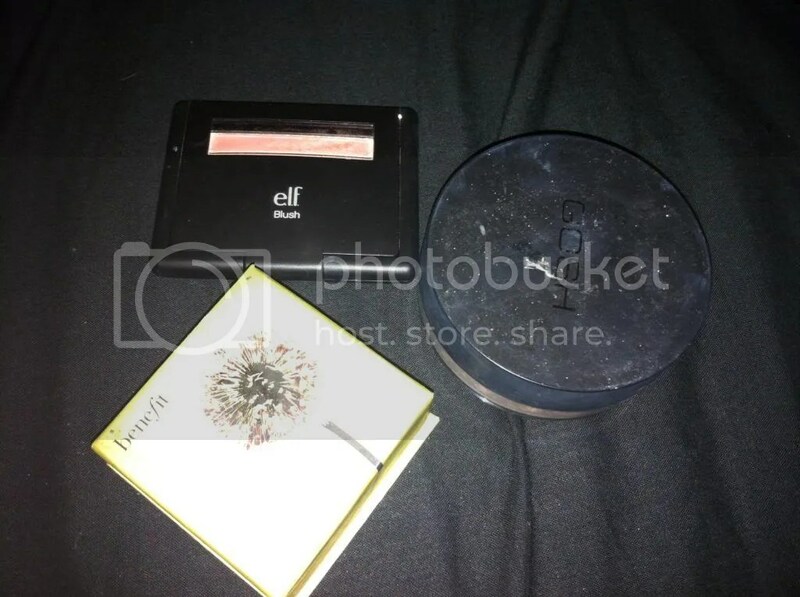 The other blush-type product I’ve chosen for this week is the E.L.F. Studio blush in Tickled Pink- as it suggests, a pretty pink colour with some slight shimmer. 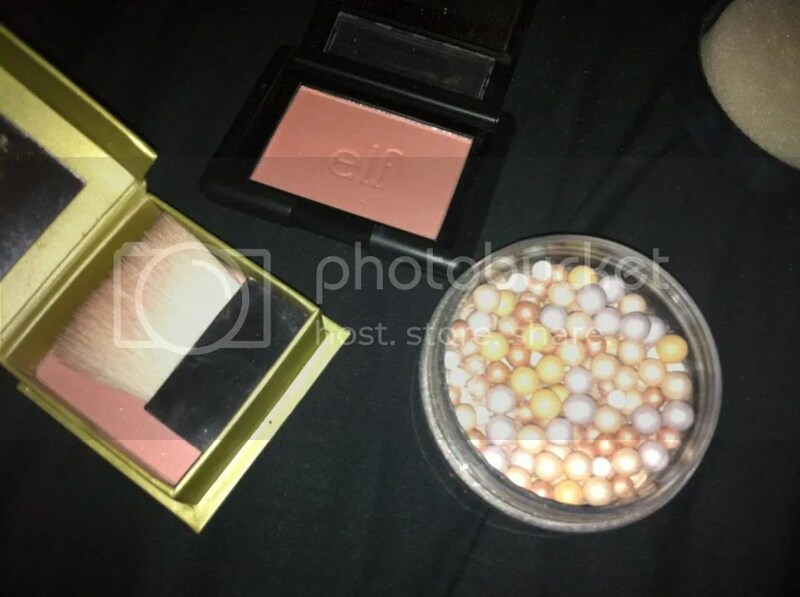 Most of my blushes, with the exception of my two cream blushes, are shimmer, so if anyone could recommend me a decent matte powder blush I’d be very grateful! The last product here is one I forgot I had! It’s GOSH Precious Powder Pearls in Magic, which as far as I can see are little pearls of bronzer and highlighter. I hope they’ll give me a nice glow, but I’m worried there’s a reason I forgot about it! A quick shot of those goodies with their lids off! For my face this week, I’ve just chosen two products. I mentioned yesterday that I was a bit anxious about this one- I’m only using this liquid foundation, but I do have my translucent/HD powder to set it with. 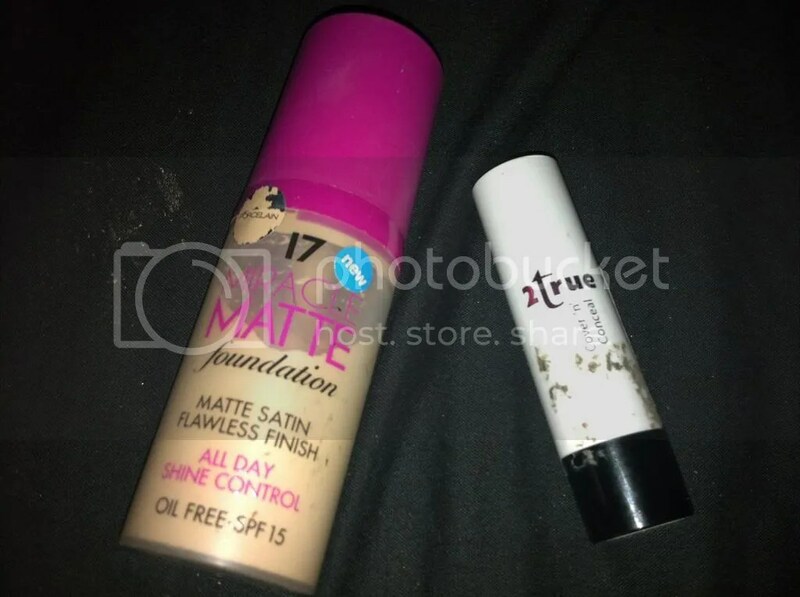 This is Boots 17 Mircale Matte foundation in Porcelain- as you can see, fairly used!- but I’m not yet convinced it lives up to its ‘matte satin’ or ‘all day shine control’ promises. I need to give it a few more wears before I can tell you for sure, though! Concealer wise, I’m going with 2True Cover ‘n’ Conceal in Shade 3. I am so surprised that I have Shade 3 here, as that is the darkest shade, but apart from being a little orange it seems okay. Maybe my seeming moment of madness paid off! Last but not least, my lip products for the week. I’ve just picked three products this week, without a liner, as the selection includes a pencil style lip colour, a tint and a gloss. 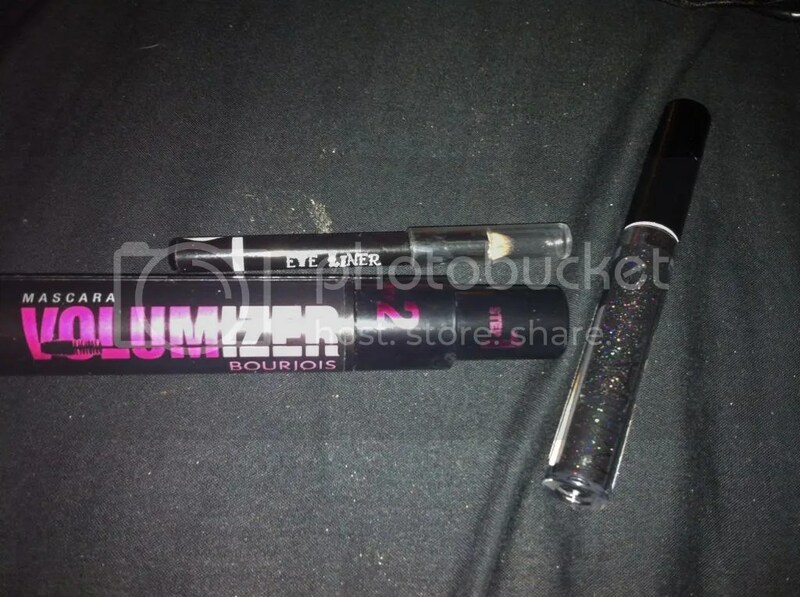 No need for liner, really. From top to bottom in the photo, I’ve chosen E.L.F. Studio matte Lip Colour- pretty sure this one is Tea Rose, which as a MLBB shade- and I really like these products. They’re twist up, pencil-style lip colours and this makes it really easy to outline and fill in your lips. They’re a little drying as they are matte, but not bad pigmentation wise. 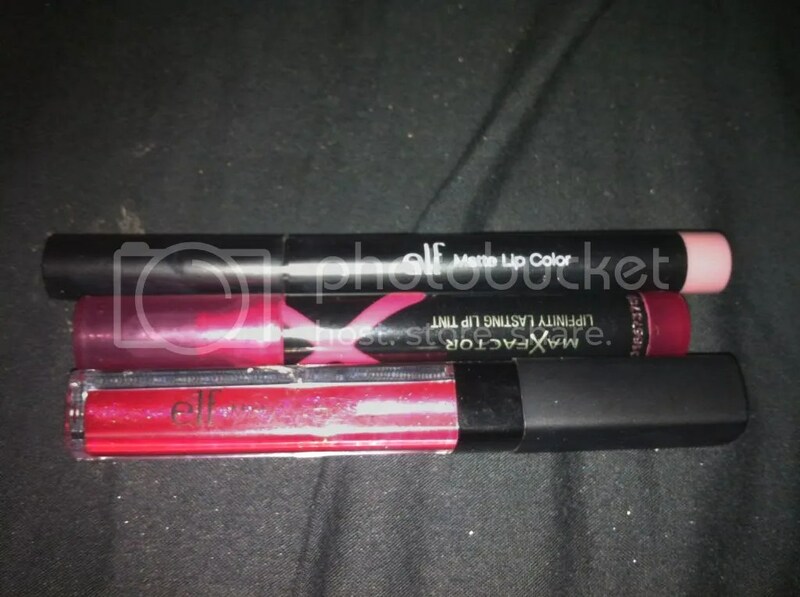 Next is MaxFactor Lipfinity Lasting Lip Tint in shade 06, which comes out a really nice, deep pinky red colour. I need to use this more! Finally I’ve chosen an E.L.F. Studio Minty Lip Gloss in New York City. These aren’t pigmented, at all, but are nice on the lips and not as gritty as you’d expect, given how much glitter they have, and the minty smell is quite nice. I’m looking forward to the looks I can do this week. I hope you’re enjoying my stash shopping endeavours. 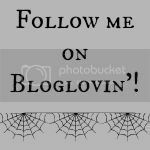 Have you used any of the products I’ve chosen for this week? 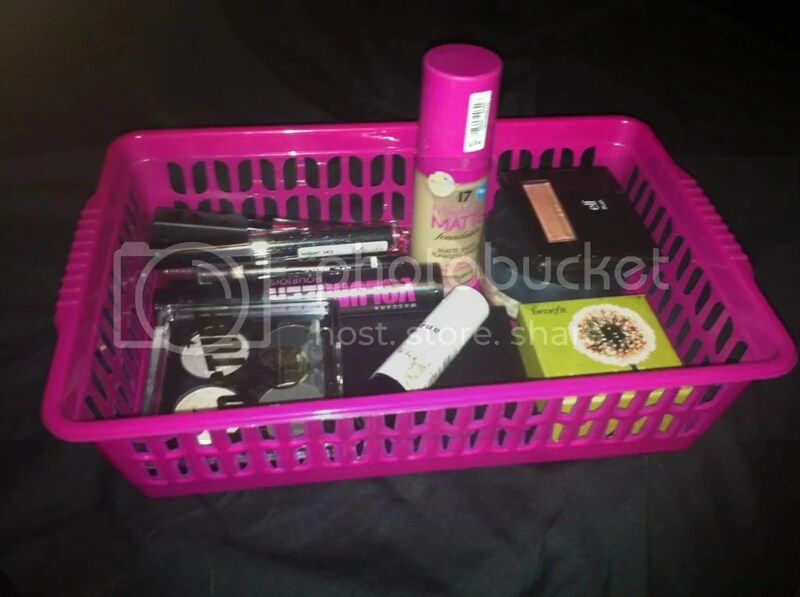 This entry was posted in Beauty, Hair, Makeup, Fashionista Musings and tagged 17, Benefit, boots, ELF, GOSH, Maxfactor, MUA, seventeen, Shopping the stash, Sleek, soap and glory, Spending ban. Bookmark the permalink.